How can God have mercy on us sinful wretches? The story of David and his sin against Bathsheba, Uriah, and most of all God (2 Sam 11-12), tells us of how God’s mercy extends further than we could have imagined. This was adultery and murder — not something God could just “wink” at. In fact, God cannot wink at any sin. However, in the Mosaic system God had set up a system of sacrifice that allowed for the forgiveness of various sins. Thus, people would bring a sacrificial animal for this purpose. But what is most interesting and important for us in this story is that not every kind of sin was forgivable in the Mosaic system. Adultery and premeditated murder, in this case, had no sacrifice for sin. “You are the man,” says Nathan. The prophet then declares everything God had done for David and yet how David had despised the word of the LORD and done what is evil in his sight. And when David hears this, he confesses. “I have sinned against the LORD.” And Nathan replies, “God has taken away your sin, you are not going to die.” What? How could he say that? There would still be consequences for David. But he had received forgiveness. How could this be? As mentioned before, in the Mosaic system, there was no sacrifice for adultery, no sacrifice for murder. In short, there was no way of dealing with this extent of pollution. There was really no way for David to be forgiven, nothing that would allow him to be right before. Within the Mosaic system, David was a dead man. The King of Israel, the people of God, stood condemned — accountable to die. And yet God declares that he is forgiven. What is this? This was clearly a ‘new mercy’, a new kind of forgiveness. In Psalm 51, we read there was no “desire for sacrifice.” And indeed, for there was no sacrifice to bring. …just as David also speaks of the blessing of the one to whom God counts righteousness apart from works: “Blessed are those whose lawless deeds are forgiven, and whose sins are covered; blessed is the man against whom the Lord will not count his sin (Rom. 4:6-8). God was slowly revealing himself and the great extent of his love for us. Here is a mercy greater than which could never be conceived! Such was God’s love for David (and all the elect) that he would see to it that there would be a way of forgiveness. And at the proper time, God sent his only begotten Son to become the lamb who would be slain for the forgiveness of all our sins. Oh how great is the love and mercy of God. And yet we see how God slowly reveals himself overtime, through redemptive history. This is the God we worship — one who reveals himself in stories like this. I am writing to you, little children, because your sins are forgiven for his name’s sake (1 John 2:12 ESV). Can we ever emphasize the forgiveness of sins too much? Some might think we can. The concern is that by focussing too much on the cross, we won’t be able to move on to things which pertain to our ‘new life’ in Christ. Such a continual emphasis on the sin-atoning, wrath-turning, law-satisfying, penalty-paying, work of Christ is thought to short-circut the very life it intends to bring about. 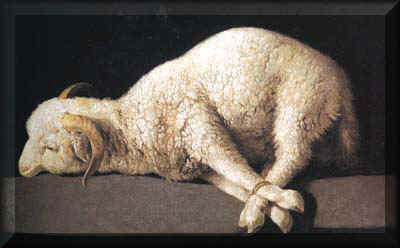 If we’re always thinking of the “Lamb who was slain”, will we not overlook the Son in resurrected and ascended glory? But what I believe this concern overlooks is the sad but true fact that we ever remain painfully sinful in this life. For this reason, we can never ‘move past’ our need for the cross. We must ever come back to that fount of every blessing. As long as we trudge this pilgrim land, all right worship of God will naturally flow from our continual forgiveness and assurance of pardon at the foot of the cross. In fact, it is every practice which assumes the contrary, that in the end, will circumvent sanctification. Only by continually beginning, and returning, to the cross will the ‘new life’ and sanctity which we so desire take solid root. For there is no other way to relate to God, except through the perfect work (life, death, and resurrection) of Christ. In fact, God’s grace-mercy-favor rests upon us for this reason and this reason alone–even the merits of Christ. Similarly, Calvin understood that faith, not works, must be that foundation for all of our confidence before God. Faith, not works, is that wellspring from which every other saving grace flows. Unlike many who have attempted to mix faith and works as the ground or foundation of our confidence before God, we must rightly give the priority to faith alone. Justification must have the logical priority over sanctification. We must begin our hourly, daily, and weakly journey from our gracious entry point in the Sabboth rest of justification by faith alone. For it is the Lord who sanctifies us. …lest the preceding exhortation should obscure the free remission of sins, he [John] again inculcates the doctrine which peculiarly belongs to faith, in order that the foundation may with certainty be always retained, that salvation is laid up for us in Christ alone. Holiness of life ought indeed to be urged, the fear of God ought to be carefully enjoined, men ought to be sharply goaded to repentance, newness of life, together with its fruits, ought to be commended; but still we ought ever to take heed, lest the doctrine of faith be smothered, — that doctrine which teaches that Christ is the only author of salvation and of all blessings; on the contrary, such moderation ought to be presented, that faith may ever retain its own primacy. This is the rule prescribed to us by John: having faithfully spoken of good works, lest he should seem to give them more importance than he ought to have done, he carefully calls us back to contemplate the grace of Christ. Your sins are forgiven you Without this assurance, religion would not be otherwise than fading and shadowy; nay, they who pass by the free remission of sins, and dwell on other things, build without a foundation. John in the meantime intimates, that nothing is more suitable to stimulate men to fear God than when they are rightly taught what blessing Christ has brought to them, as Paul does, when he beseeches by the bowels of God’s mercies. It hence appears how wicked is the calumny of the Papists, who pretend that the desire of doing what is right is frozen, when that is extolled which alone renders us obedient children to God. For the Apostle takes this as the ground of his exhortation, that we know that God is so benevolent to us as not to impute to us our sins. Is God’s Mercy for Me? Also, there are very many who so conceive of God’s mercy that they receive almost no consolation from it. They are constrained with miserable anxiety at the same time as they are in doubt whether he will be merciful to them because they confine that very kindness of which they seem utterly persuaded within too narrow limits. For among themselves they ponder that it is indeed great and abundant, shed upon many, available and ready for all; but that it is uncertain whether it will even come to them, or rather, whether they will come to it…. Therefore, it does not so much strengthen the spirit in secure tranquility as trouble it with uneasy doubting. But there is a far different feeling of full assurance that in the Scriptures is always attributed to faith…there is no right faith except when we dare with tranquil hearts to stand in God’s sight. – Calvin, Institutes 3.2.15.